Facebook security has now become the most important concern among the users. They have become so careful that in order to secure their account they click any sort of irrelevant links. As for now, Type Gratula in comment by Mark Zuckerberg Facebook social media rumors, has become viral in the platform of Facebook. Social media is a good platform to share and discover things and connect with friends. But nowadays anything shared on social platform has become unbelievable. People are so much engaged into it that being unaware of anything and the truth, they take actions and fall into trouble. Type Gratula in comment by Mark Zuckerberg Facebook social media rumors, is another way to trick people and get them to be the victims of the consequences which are not yet known. The word GRATULA, turning to be red or not is not at all related to the security of your account. A message got viral in these recent days at Facebook, that asks the user to type the word GRATULA in the comment box, further notifying the user that if the word turns red their account is secured and if not their password has been hacked. Moreover, it asks the user to change their password. In no time people had already fallen into the trap of this fake news. "Mark Zuckerberg, Facebook CEO, created a new word GRATULA. To make secure your account is secured, type GRATULA in the comment. If it turns red, your account is still safe, if it does not change to red, please change your password ! Your account has been hacked ..! Already changed your password ..? Hurry up now !!!! " From not many days before, Facebook is been showcasing the word CONGRATULATIONS in red. It's nothing but only a sort of path to catch the eyes of the users as a source of fun. The same is the case with the word GRATULA now. Facebook turns it to be red just in order to arouse some sort of excitement among the users. Nothing more is beyond it. It's not at all related to the security of your account. Facebook has already developed privacy and terms in order to secure the accounts of the user. Messages and news like this are undoubtedly fake to a great extent. In order to use any social media platform, people has to work upon it very carefully and by not abiding it's rules. Being educated and falling prey to certain sorts of harmful things on social media makes only yourself responsible towards it. Every time new and more eye catching messages and news shall get viral on social media, the consequences of which you might not know at all. Try to stay far away from such sort of irrelevant things in order to secure not only your account but also your life. Try to use social media in a convenient way by not being victims of the consequences of such fake things. 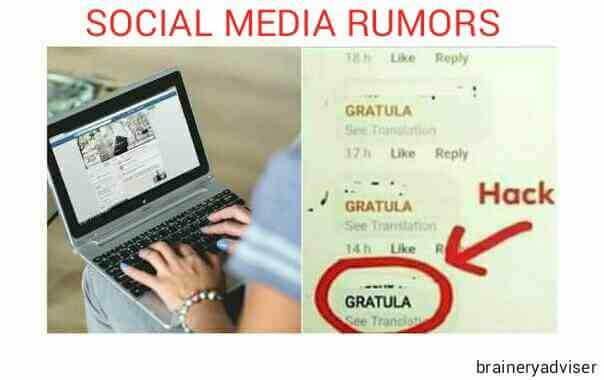 Spread the news regarding Type Gratula in comment by Mark Zuckerberg Facebook social media rumors, as much as you can. DON'T FALL A PREY. Be safe and make your near and dear ones also aware of it.